Good morning! Welcome to The Morning Shift, your roundup of the auto news you crave, all in one place every weekday morning. Here are the important stories you need to know. Consider them your “desert island” stories, should society collapse in the imminent future. 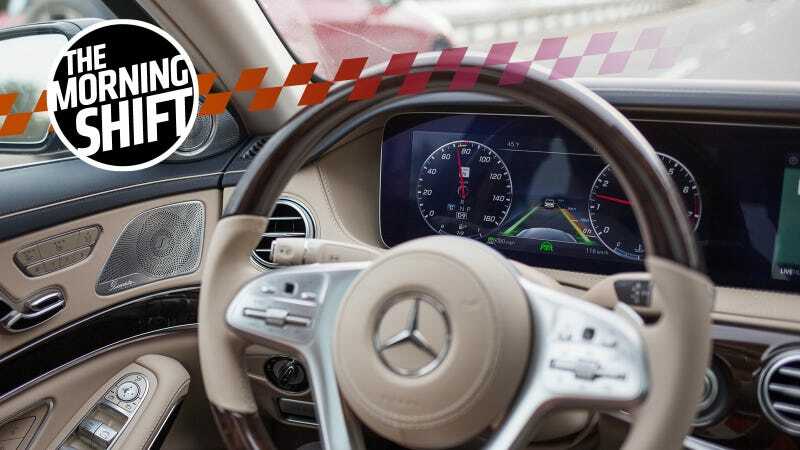 1st Gear: You’re Trying To Tell Me Carmakers Are Only In It For The Money? Carmakers continually talk about how much their newest waves of driver-assistance technologies will save lives. It’ll save your life, if you follow whatever ad campaign is new right now. You might think that these carmakers, so concerned with your wellbeing, would do everything they could to get this safety tech into as many cars as possible, as quickly and as cheaply as possible. That’s not how it’s happening. Here’s an example of the complicated pricing for the 2018 Chevrolet Traverse: If you go shopping for a base-model Traverse L that starts at $30,925, you can’t get blind-spot detection, rear cross-traffic alert or rear park-assist. Those are available on mid-level $36,095 LT trims, but you’ll have to pay extra to get them. Go for the $45,995 front-wheel drive Traverse Premier trim, and you can opt for a safety package that adds low-speed automatic-braking, collision alert, lane-departure warning, lane-keep assist and front pedestrian detection — but you’ll have to pay an additional $475 to get it. Only on the $48,895 all-wheel-drive Premier trim do all of those features come standard. GM’s cross-town competitor the Ford Escape starts at $23,850. To get the Safe and Smart package with rain-sensing windshield wipers, auto high-beams, blind-spot detection, cross-traffic alerts, lane-keeping and adaptive cruise-control with forward collision-warning, you’d have to buy — at minimum — the $25,605 Escape SE trim, and then opt for the $1,295 Safe and Smart package on top of that. I’m sure that the auto industry will sort this all out once full autonomy shows up. It’s for our safety, right? A few weeks back, Volkswagen argued that a recent Netflix “Dirty Money” documentary covering VW’s diesel cheats included discussion of the company sponsoring a group that tested diesel fumes on monkeys. The whole gassing things isn’t a good look for Volkswagen, and the company asked for a few months for everyone to, uh, calm down. Yesterday, the judge threw out the request, as Reuters reports. Nice try. About 800,000 Toyota Priuses in the U.S. were recalled in 2014 to address overheating that damages the car’s inverter, a key part of the electrical power system. A lawsuit brought last year by one of Southern California’s largest Toyota dealers asserted that the software fix did not solve the overheating problem and could lead to an abrupt loss of power. A related complaint by the dealer is now under review by the National Highway Traffic Safety Administration. I’m so jaded at this point that I’ve given up hope that any car will ever be clean or environmentally friendly. The big news about FCA recently has been the UAW scandal with millions of dollars being swindled away from union members, or if not that then the company’s struggles to get Alfa Romeo going in the United States, or if not that then the diesel cheating crisis going on with Ram trucks. Marchionne reportedly needs a replacement. Sounds like a good gig, if you ask me. Daimler announced today that it will have an electric semi truck of its own called the eActros in production in 2021, as Reuters reports. Daimler claims that its range should be 124 miles, which is way down on Tesla’s claimed 500 miles. But the real question is which company actually puts this stuff into production when it says it will. I have my doubts about the Silicon Valley side. Neutral: When Do You Think You’ll Have Driver Assistance Tech In Your Car? Do you even want it? Will The Autonomous Car Revolution Leave Poor People Behind? What If Autonomous Cars Just Never Happen?